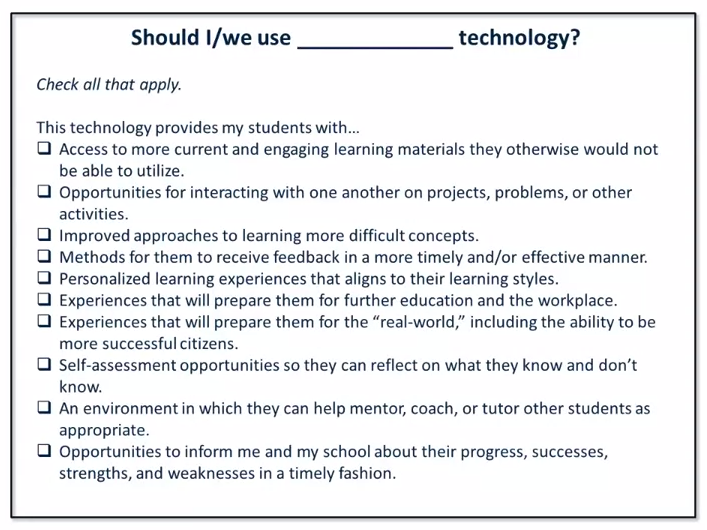 Emerging Trends and Technologies in the Virtual K-12 Classroom - investigate how we can more deeply engage students in the virtual classroom through the use of innovative practices and technologies. I was interested in this because I have facilitated a number of online classes over the past year, though all for adults. I've also participated in many different online workshops and MOOCs - with varying degrees of satisfaction - and since I believe there is a huge future for virtual learning I definitely wanted to know more about this, and in particular how this could be used with students in elementary school. The course seems to address the needs of elementary as well as secondary, so yesterday I signed on and started the course. The first thing we considered was the whys. Our K-12 students are the "millennial" generation who expect instant feedback, individualized instruction, who are highly visual and who are good at multi-tasking. 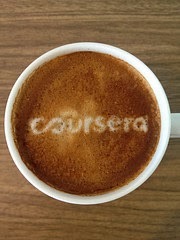 Online learning seems ideal for these types of students. In addition the successes of online learning is supported by various learning theories: technology is good to use for social, constructive and collaborative learning and lends itself to learning in active groups. Virtual learning also offers the opportunity for hands on activities, project based learning and games that develop problem solving skills. Technology allows the courses to have a broad reach and provides the instructors with rich data that can be used to personalize tasks. The fact that most of the administration is done by the computer also means that the teacher is freed up to interact more with individual students. The second thing we were introduced to was the whens. Virtual learning succeeds when you are planning for access beyond the school and when you are looking for up to the moment data and simulations. It also succeeds when you are looking to improve learning outcomes as it provides opportunities for continuous improvement because of the immediate feedback. 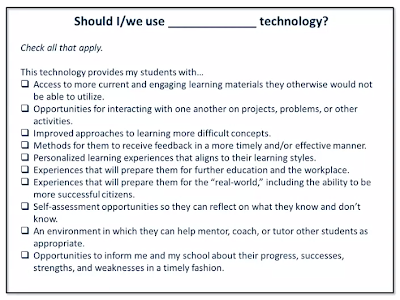 I was really interested to see the following graphic on the first video of the course, which to me asks excellent questions about when technology should be used so that it is planned for and used in an intentional way to improve learning.